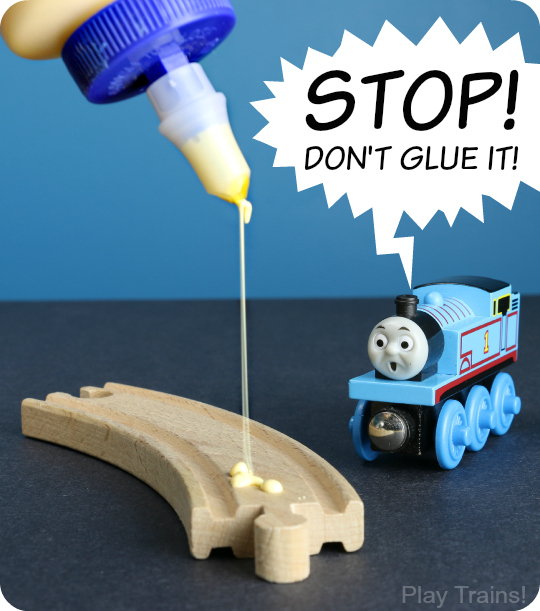 Many parents decide that gluing wooden train tracks to their child’s train table is the way to go. If you’ve ever watched a toddler playing with a wooden train set — tracks being pulled apart, bridges getting knocked over, the child getting frustrated, and parents rebuilding the layout over and over — it’s easy to see why! But when that same child is old enough to want to build his or her own tracks, that possibility will no longer be open to them. Fortunately, there are several temporary alternatives to glue that preserve the play value of a wooden train set for the future. And if you do decide to glue your tracks down, I have a few ideas for how to keep things interesting for longer. I understand this temptation, and its roots in the frustration of rebuilding the train tracks again. And again. I, too, have thought back to moments spent sitting blissfully on the sidelines while my toddler played, enthralled, at the bookstore train table, with its charming — and immovable — train layout, and wondered why it couldn’t be so easy at home. Gluing the tracks to the train table turns a wooden train set from an open-ended toy into a one-purpose toy. So much of the value of these wonderful toys lies in the creative, constructive possibilities inherent in the wooden train tracks. Beyond the countless possible train layouts a child could build, I’ve seen my son use his tracks as building materials with building blocks, invent “traps” for his wooden trains, have train track sword fights, and many more spontaneous reinventions. For more inspiration, my picture book, Old Tracks, New Tricks, includes more than twenty imaginative STEM/STEAM activities to do with wooden train tracks and trains, both in the story as the characters try them out and in the back as activity instructions. There’s also a kid’s guide to inventing one’s own track tricks. Gluing the tracks to the train table will shorten the time the train set is interesting and developmentally valuable to your child, most likely by years. Think about it: while pushing a wooden train around the same track over and over may (or may not) interest a toddler for several months, how long would that occupy most four- or five-year-olds? If a child’s wooden train set is glued down, that child will likely seem to “out grow” trains much sooner than a child who can begin to experiment with building layouts. I hear of many children continuing to pull out their old wooden tracks from time to time though elementary school. Which is unsurprising, given the open-ended, creative, puzzle-like challenge that makes track building so enjoyable for some of us adults! Some children — despite enjoying train tables in stores and other public places — seem surprisingly uninterested in the beautiful new train table in their home. Often taking the trains and tracks off the train table is all it takes to renew their interest in trains. If the tracks are already glued on when the train table is presented to the child, there’s no opportunity to see if they’ll play with them away from the train table. Gluing the tracks to the table also can limit and shorten the usefulness of the table. We have gone back and forth between using ours as a train table, a LEGO table, an art table, and an activity table. Train tables can be converted into other types of tables once they aren’t used as train tables anymore. That’s not impossible to do if the tracks are glued down, but it does make it harder. For most families, gluing down the tracks is a waste of money. After all, wooden trains aren’t cheap. Anything that drastically limits the variety of play and shortens the time a toy will be valuable to your child is something that is preventing you from getting your money’s worth. First, reexamine the necessity. Ask yourself, “Am I gluing the tracks to the train table to save my child from frustration, or to save myself from frustration?” Or does it just seem like the thing everyone you know does with train tables — the collective parental wisdom that sounds logical? Like I said above, I’ve been there, wishing that the trains were an independent play activity when my son was a toddler. But more of the fun — and so much of the educational value — we’ve gotten out of my son’s love of trains has been from building train layouts together than from playing with them. It’s one of those “it’s the journey, not the destination” things. If your child isn’t too frustrated by the tracks falling apart, try focusing on making the most of building the tracks with them. Even when they are too young to put the tracks together themselves, there is so much children can learn from watching you, giving input into the design of the layout, and helping in any way they can. And their early attempts at fixing broken tracks and building their own layouts, while perhaps not successful, seem to encourage all sorts of great things — problem solving, fine motor skill development, spatial awareness, asking for help when it’s needed, and so on. However, if your child is getting overwhelmingly frustrated with the tracks coming apart, that’s a different situation. Then I believe securing the tracks in some way will make train play more fun and more valuable to your child. And I completely understand that some families truly don’t have the time to put the tracks together over and over again. And that’s okay. If your child is happy to play trains alone as long as the tracks stay together, and you really need those moments of peace, I’m so happy you can find them! There are plenty of other ways to engage with children through train play if you just don’t have the time to build the tracks with them. However, you can secure the tracks in temporary ways. Here are some temporary alternatives for attaching train tracks to a train table. Safety warning: some of these methods involve materials that, depending on what size you make them, could be choking hazards for children who are of the age or still in the stage where that is a concern. Please keep that in mind when considering and implementing these strategies. No-residue Duct Tape ( US / UK / CA ) is my number one recommendation for keeping train tracks together, mostly because I know from experience that it really works! We had a track running around the top railing of the Little Engineer’s KURA bed from IKEA for almost two years, with the tracks held together with small pieces of no residue duct tape and secured to the railing with loops of the tape attaching it every few tracks. When we removed the tape after all that time, there was no damage to our tracks and nothing sticky left behind. As I mentioned in the Bridges and Elevated Tracks section of our Ultimate Wooden Train Guide, you can use loops of the no-residue duct tape to attach tracks to elevated track supports. We’ve also used loops of the tape to attach wooden building blocks to each other and to the tracks to make our own custom supports. I hear blue painter’s tape also works, but it’s not as strong as the duct tape, and I believe that it isn’t meant to be left on unfinished wood long-term. Carpet Tape ( US / UK / CA ) is an idea my husband suggested when I was discussing this post with him. We haven’t tested it with wooden train track, and I don’t know much about carpet tape myself, and he pointed out that there’s a possibility that it could pull up the paint on the surface of the table when the track is removed later. So there’s that. But it has the advantage of being double-stick, so there’s no need to make tape loops like we did with the no-residue duct tape. (If you’ve used carpet tape to temporarily attach train tracks to a train table, or decide to give it a go after reading this, please let us know how it works in the comments!) Update: I’ve heard from a reader that the carpet tape idea does, indeed, work. Hooray! Suretrack Clips ( US / UK / CA ) are another way to keep train tracks together. These work pretty well, but they do tend to loosen up slightly with use, so be prepared to adjust them from time to time. But they will certainly decrease the frequency with which you’ll have to rebuild the tracks. Also, they can be used to build all sorts of exciting train tracks. For some examples, see our Wooden Train Ski Jump and DIY Upcycled Wooden Train Platform posts. Mounting putty (poster putty) is something I’ve used to attach decorations to tracks (Wooden Train Track Christmas Ornament), LEGO to trains (Design Your Own LEGO Wooden Train), and tracks to all sorts of things while I was shooting the photos for Old Tracks, New Tricks (how else do you get a bunch of train track dominoes to hold their positions in mid-topple? ), and a reader pointed out it could be used to stick tracks to train tables as well. The putty, in my experience, is completely removable from the tracks and surfaces I’ve tried it on. (If a little is left stuck on when you remove it, just roll a piece of the putty over it.) Just make sure to use very small pieces of it, and to place them in the middle and corners of the track, to keep it sitting even. The biggest challenge with this method is going to be getting the whole track to be an even, flat surface. Glue a partial track to the table. This would work well if your child is more likely to bump the tracks and knock them over than purposefully take them apart. You could build a train layout on the table, and then only glue the tricky parts of it down — bridges, etc. — leaving the possibility to rearrange the other tracks in different ways. Or you could build a big circle or oval all the way around the perimeter of the train table, with split tracks leading toward the center. Just make sure that the split tracks are positioned in a way that can be connected by the loose tracks before you glue the oval down. 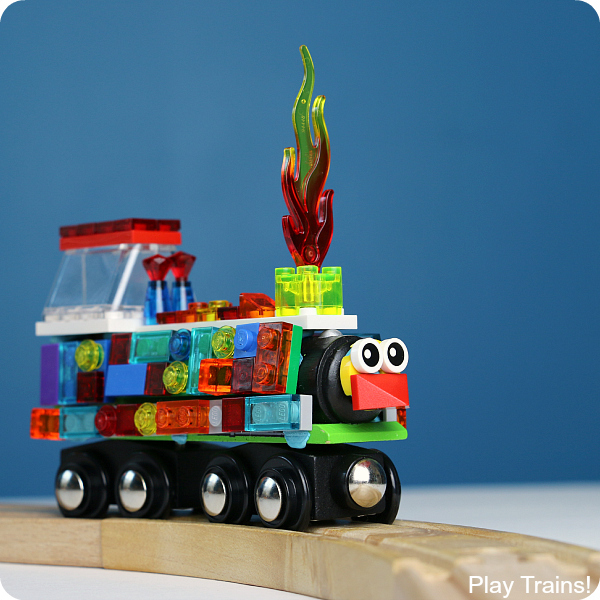 Attach a small train set to a train table for the toddler years, and wait to start a collection until later. This is another possibility, although be aware that a toddler might seem to lose interest in trains if they only have a very simple, static layout to play trains on. However, there are lots of ways to keep train play interesting. Have another idea? Share it in the comments, and I may add it to the list! This guide will be expanded with time. Have a question I didn’t answer? Ask in the comments below or by email! 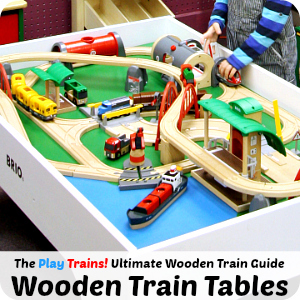 If you’re looking for a train table, check out our list of the best wooden train tables for toddlers and preschoolers. 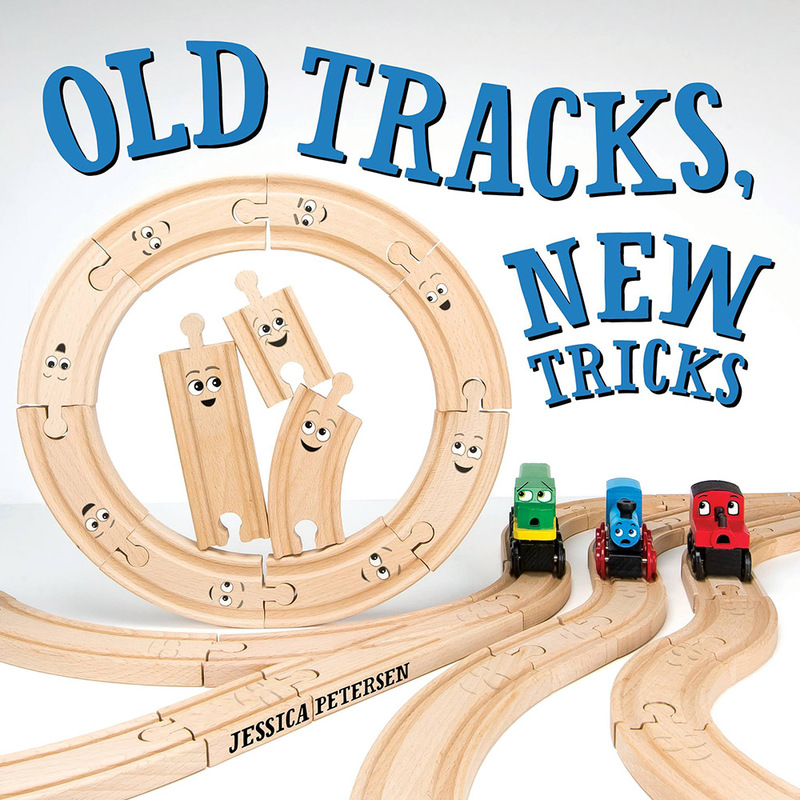 There are lots of great examples of all the creative things your child can do with wooden train tracks in my picture book, Old Tracks, New Tricks! I like the poster board gummy.They stick the tracks to the table but you can lift them and change them when you’re ready. They’re not really strong but for my preschooler when she’s playing and wants the tracks to stay still these work very well. They don’t leave any residue and they don’t wear out over time. I’ve had some of our gummy tabs for well over 8 years and they still stick the same as when we first purchased them. Oh, great idea! 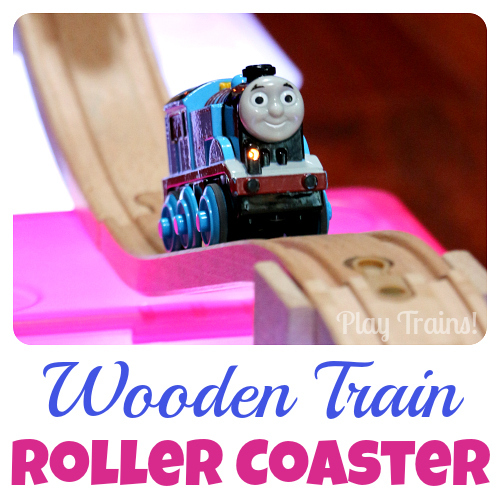 We’ve used the blue poster putty on our wooden trains (not quite the same as what you’re describing, but I think it’s similar), but I don’t think I’ve used it with the track yet. I don’t know if this would work or not, but have you ever tried Command strips? They work well for a lot of crafts, and they have clear ones available now, too. Just a thought! I haven’t tried them, but I suspect they would be a possibility! I’ve only used the hooks that come with the strips, though, so I’m not sure. How about getting a piece of plexi glass or regular glass cut to the size of the surface of the table and then glue the tracks down? You’d still be able to see the table design and not risk ruining it. You could easily replace the plexi when you want, or scrape the glue off the glass carefully with a razor blade. Probably easier to clean and disinfect too, but would show fingerprints. Maybe a textured plexi or glass of some sort for that reason if fingerprints drive you crazy! You could definitely do that, if you weren’t concerned about ruining the wooden train tracks. I hadn’t thought of that one! Thanks for sharing the idea! Zach, I’m so glad to hear that what I said rings true from your experience as well! I found your site at the perfect time! My son will be3 in June and I asked my husband to build a train table for his bday. He asked if I wanted the tracks glued down and I really hesitated cause not glued I’ll be the one putting it together all the time but I really want him to be able to change the layout in the future. I told him not to glue the tracks down and I’m so happy to find that there are temporary solutions. I will definitely be purchasing some of that duct tape! I don’t quite understand what you mean by using loops to secure the bridges. Do you have a photo? I’ll try to take one…what I mean is to take a piece of tape, hold it sticky side-out, and form it into a circle with the ends stuck together. That way there’s sticky stuff facing up and sticky stuff facing down, so it’s sort of like double-sided tape. Try zots dots (for scrapbooking) or better yet, zips (strip version of the same). They are double-sided, come in multiple sizes, residue-free and when applied to wood, come up reasonably easily for adults. I like the zips, since they’re cut to size, but I’ve used both to hold wooden pieces to the tops of those plastic bridge assemblies, and they work great! They’re not permanent, but they stand up to my two year old pretty darn well! Great idea! I’ll have to try that out sometime. My son uses the living room coffee table for his train table. Needless to say, we needed a quick way to tear apart the track when needed. When he was a toddler, he was constantly frustrated and I read about an idea using tiny rubber bands. We looped a crazy-loom rubber band around a connector about two or three times. This held the track design together and made the connection very tight. It also made it easy for me to disassemble when needed. The bands kept the the elevated sections together and prevented lots of tears. Older brother could also rearrange the track if he liked. The bands also helped us make use of some of the lower-end brand track that had quality control issues. After a few days, he would get into a destructive mood and tear some of it apart – but by that time, we were ready to have our table back. We just threw the track in a box and stored it away for a few days. Fantastic — I’m really glad to hear that this works so well! I haven’t tried it myself. This is a solution I listed on our tips for bridges and elevated tracks; perhaps I should add it here, too. Thought about this a great deal when I built my 1.5 year old a custom train table for Christmas. I decided to glue felt down to the table surface and affix adhesive backed velcro to the bottom of the wooden track. During my testing, I found that the velcro was really wrecking the surface of the felt when pulled off, and it wouldn’t allow the pieces to shift the way they need to when laying the track out. What I discovered is that the track sitting on top of the felt alone provided enough friction to keep the pieces from sliding around while still allowing the layout to shift as needed to make the connections while building. Of course, having raised edges on the table is a must just in case he tugs on a section and shifts the whole layout. So far, other than pulling the train house off to play with and knocking over supports on raised sections, he hasn’t really shown any interest in dismantling sections of track. Thank you so much for sharing your experience! It’s good to know that the velcro/felt option doesn’t work well, but that the felt provides that much friction and keeps the tracks more or less in place. I had my husband screw them down to the table and then painted the table and used fish gravel, sand, faux grass, etc to make it like a real train set-up. I have no doubt that he will outgrow this, but after watching his 4 older siblings, I discovered that they are actually more interested in upgrading trains at that point (we have a box of old Geotrax- but there are other brands). Wow, that sounds like a really cool train table! Fun! Thanks for this article! I have a little boy who has special needs. He loves his trains so much, but gets so distressed when the track breaks. I spend an awful lot of time fixing tracks, but with four young children I can’t always do it immediately, and so meltdowns ensue! While I can see all of your points, I think I will still go ahead and glue down a set. I have bought some ikea tracks specifically for this purpose, and also a piece of MDF to glue it to. My kids still have the option to build creative tracks with their gold mine mountain set (and all the extras we’ve bought), which is nearly 9 years old now and going strong! Hopefully we’ll then have the best of both worlds! I think this sounds like a great plan for your family! Ikea tracks are very useful for this kind of thing. 🙂 And isn’t that gold mine mountain set wonderful? It’s still my favorite. Ah, very clever! Thank you for sharing this! Totally made this mistake…my son promptly yanked on several track pieces and ripped off parts of the picture on the train table. Gave up and meticulously pulled all of them off and just put them in a bucket for him. Turns out he is one of those kids who is all over the train sets at the book store and hair cut place but at home it is just another thing taking up space. Lesson learned. I have two ideas that come to mind. 1. The nonslip mats that go under rugs (can be bought at the dollar tree) attached to the bottom of the tracks to keep them from being bumped around. Buy on a roll..nead it in sizes u like. I put it on the table underneath trap connection points. I put it underneath Bridges. You can choose to put it in between connection points. It is removable. It doesn’t dry out. It’s not messy to use. Tried tested and true. Hands down it is the best option. Thank me later. I just Googled it, and this looks promising! Thanks! I’ll have to try it out. I added velcro to the bottom of the train tracks. Using the sticky velcro, I secured the tracks and will be able to easily remove the velcro strips once we are ready to move the tracks. We also can move the tracks to an extent. We are only limited to the areas where I attached the velcro. I also only attached about half of the track pieces. I have 2 almost two year olds and a 3 year old, so my oldest likes to be able to build her own tracks. That’s a great solution! Thanks for sharing! So i was thinking about mounting magnets on each side, it could be one of those small round magnets from ebay that you can screw into the rail. Of course it need to be drilled out of the track for it to be level with the surface, hoever you would only need one on each side of the track to work. This ofcourse alsop mean that a thin metal sheet should be put on top of the table, or glued onto some MDF or Plywood sheet, which can then be painted for the tracks to be layed on. If done right it could be small square pieces which is easy to put aside when not played with. I have not done this myself yet, so i have nothing to show for it, but i would be happy to put pictures up when i have tested it. This is a fascinating idea! I would love to see what you come up with. (Also, my son used to ask to have a way to put train tracks on the wall or ceiling, so I would love to know if you can stick them to the fridge!) My one concern — which you’ve likely already been thinking about — is that the magnets would have to be really, really well secured to be safe for young children. I’d recommend using glue to hold the screws in even better, and then being sure to inspect the magnets regularly. Definitely let me know how this turns out! I agree, they should be really secured. ive done some fast testing on a sacrificial rail, and there is some problems that is showing. 1. when placing magnets on each side, you end up with some interference with the connection magnets on the trains. So when you are running over them, you can feel its dragging, so its not running as smooth as used to, plus it will not continue to roll if you fx. roll down hill, the magnets will brake the trains. This problem if not shown if the magnet is only on the side that is facing down, and thats not a problem with the traight rails, to only put them on one side, its another thing on the curved ones, placing a magnet on only one side will prevent you to use the rail to turn the other way. Of course it depends how big the magnet is, but if its smaller, it dosnt stick as well, and you still feel the magnets dragging when you run over them. also you have to be 100% sure that the magnet is level with the surface of the rail, otherwise it affects the magnets power to keep it in place.